NIA CHARLESTOWN NEVIS (APRIL 08, 2016) — United States of America Ambassador to Barbados and the Eastern Caribbean Her Excellency Linda Taglialatela expressed satisfaction with the status of an early flood warning system implemented on Nevis through the Organisation of Eastern Caribbean States’ (OECS) Reducing the Risks to Human and Natural Assets Resulting from Climate Change (RRACC) Project. 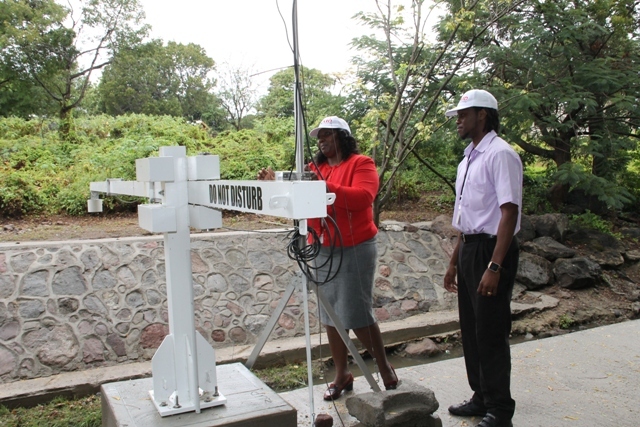 The ambassador’s comment came on April 06, 2016, at Bath Stream, during her visit to the sites where the monitoring equipment is installed. The project which is funded through the United States Agency for International Development (USAID) is a collaboration with the the Nevis Island Administration (NIA). “Given the concerns about flooding in the Nevis area, I think this has been a great joint project. We appreciate the support and collaboration between our government and the government of Nevis and we are very happy to be here to be able to share in the success of this project,” she said. 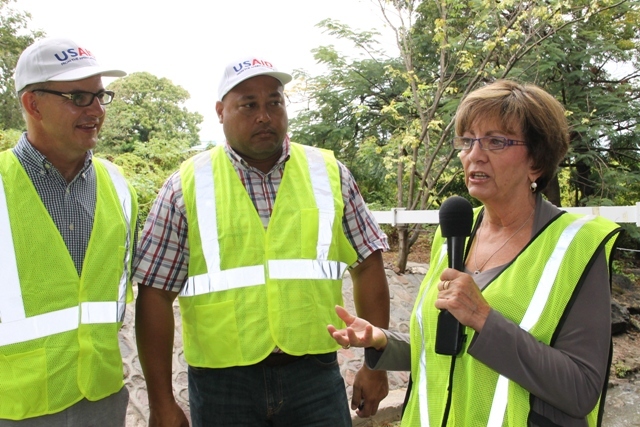 Lester Arnold, Project Coordinator the OECS RRACC Project, who accompanied the ambassador noted that the installation at the Bath Stream would serve to measure water levels and send out signals via a siren system warning persons of imminent flooding in the area. He said it forms part of the flood mitigation system along with installations at Stoney Hill, Morgan’s Estate and at Nisbet Plantation. Arnold said apart from the flood level recorders at Bath and Nisbet, the other installations are essentially hydrometric equipment which are used to measure the amount of rainfall that is recorded every 10 minutes and form part of a flood modelling system tied to the Caribbean Institute for Meteorology and Hydrology, based in Barbados. He noted that the data collected would be used to help predict floods or droughts in the near future for Nevis and neighbouring islands. Arnold used the opportunity to thank the American people, through the USAID project in collaboration with the OECS Commission, on behalf of the Director Dr. Didacus Jules for their generous support for the project. Also present were Ted Lawrence, USAID Director for the General Development Office for Youth, Citizen Security, Climate Change in the Eastern and Southern Caribbean and Julie Limoges, Political/Economic Officer at the Embassy of the United States of America to Barbados and the Eastern Caribbean.